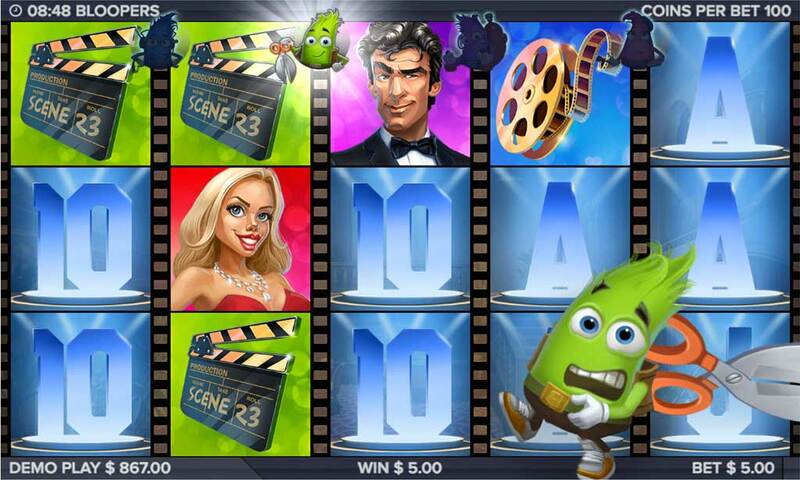 Bloopers is a 5 reel video slot game that has over 243 ways to win. This game features colourful sound and tech creatures who are waiting on a set to record your bloopers. Don't forget to read more about promotions before you start. If you are all set, then spin through this contemporary 5 reel and match Wilds and Scatter symbols to earn yourself some huge cash rewards, right here at Wizard! Even though Elk Studios are one of the newer entrants to the market, their high-quality products already make them join companies like NetEnt at the peak of the slot development mountain. They have a very creative team and work with a high level of innovative technology. Elk Studios assures that they deliver every product with a human touch. And even though the company was only founded in 2012 they already have a huge repertoire with a nice variety of spin slot games. Bloopers are all about those funny mistakes that occur while producing a movie. On the 5 reels and 3 lines, besides the low-value symbols A, Q, K, J and 10, you can find movie themed symbols: a clapper board, a reel of film, a female and a male lead character. It has stylised art and the two leads are a mix of cartoon and caricature, reinforcing the funny nature of this video slot. It's undeniable that this can be one of the best new online slots for new players. There is an enormous number of 243 paylines that increase chances of winning massively. You can bet between 25p or up to £250 to be part of the blooper reels and coming out with a big win in your hands isn’t out of the equation completely. And even though, as already mentioned, the art style is very stylised, this game has a big Hollywood feeling, focussing everything around movies, and even the reels are transformed into reels of film. All the symbols are set in the spotlight, and so will you once you win with one of the great bonus features. The main feature of this video slot is what makes it so profitable: the Bloopers. You have 5 different bloopers that will walk randomly over the reels during the base game or free spins and award you with different prizes. The wild is represented by the wild bloopers logo and will replace anything except for the walk of the fame star bonus. You can activate this bonus by landing three or more of the bonus stars on the reels and it will get you free spins. Each star also represents a logo of a specific blooper which will be active during the free spin rounds. The two leads will turn into sticky wilds during these rounds and help you get more winning combinations, but as soon as reel two, three and four are covered with these wilds the round is over. During the base game, there is only the sound tech blooper that is active and will place sticky wilds on the reel and reward you with a respin. During the free spins, depending on the bloopers that were displayed on the stars that triggered the free spins, you will find different bloopers active. The Stunt Man will transform wilds into an expanding wild, the Cutter will award “falling symbols” which may form new winning combinations, the Make Up blooper rewards you with extra free spins and the Fix It blooper moves symbols around to create winning combos. Usually, bloopers can cause the producers of a movie to lose a lot of time and money but in this game, bloopers are highly rewarding and profitable. The video slot has some humour too with its stylised art and adorable bloopers that will make you giggle. It represents the Hollywood feeling very well putting everything into the spotlight, including yourself when you discover winning combinations. Another crazy game to have a go at is foxin wins.